This recipe is simple. But you need a proper rotisserie you are comfortable with. The trick is to give the fruit some pizzazz with a nifty spiral cut. 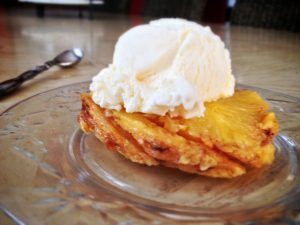 We used a crystal cane sugar because it has a higher burn temperature and it will create a caramel crust. Slice in rounds right off the spit or slice and serve with a dollop of ice cream. Your barbecue guests with think you are showing off and will love this flashy and delicious desert. Peel pineapple and carve spiral grooves for decoration and to hold sugar mixture. Rub with reserved melted butter, cocoa, and sugar. Create "pilot hole" to help drive spit through core of the pineapple and secure with probes and pliers. Slice and serve plain or with ice cream..
I’ll be the first one to tell you I have limited experience in Chili cook offs. But I tried my hand in a competition at my church this weekend and feel like I’ve come up with a trick for scoring first place in you next chili recipe competition. 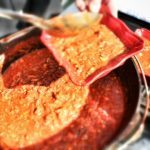 Previously I posted a recipe for Third Place BBQ chili here. Looking back to prep for my latest challenge I realized how lame it was. Chili seasoning mix… pork loin… fresh tabasco peppers… It wasn’t very authentic (seasoning mix?) or practical (have you seen fresh Tabasco peppers at the grocery?). A quick call to Jack got me a great tip. “Make your own chili powder. You’ll have a better flavor profile than the store bought stuff,” he advised and sent me what had won for him in the past. I took his advice and am now convinced that using a hand crafted fresh batch of chili powder is a real game-changer. I took first place against about twenty other chili’s I thought were really good too. The Fist Place chili recipe is below but the real trick is the chili powder. Fun and easy to make. 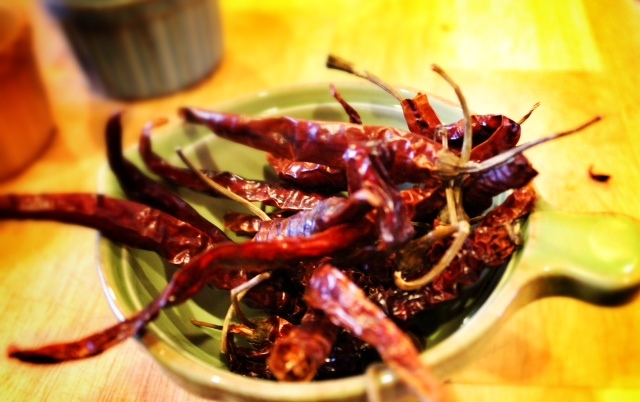 Use those dried whole chilies you see at the store (you may want to mix and match if you cant find Guajillo, Arbol or Ancho) and toast /roast them briefly in a cast iron pan. Be careful not to burn them and don’t choke on the potent fumes. Pull the stems and grind with cumin seeds in a blender, coffee grinder, or spice grinder. Simple. Try the recipe below and post in the comments how it fares for you. It’s a winner. 2 oz. Ancho Chiles – dried and roasted 2 oz. 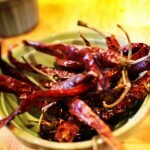 Guajillo Chiles – dried and roasted 1 oz. 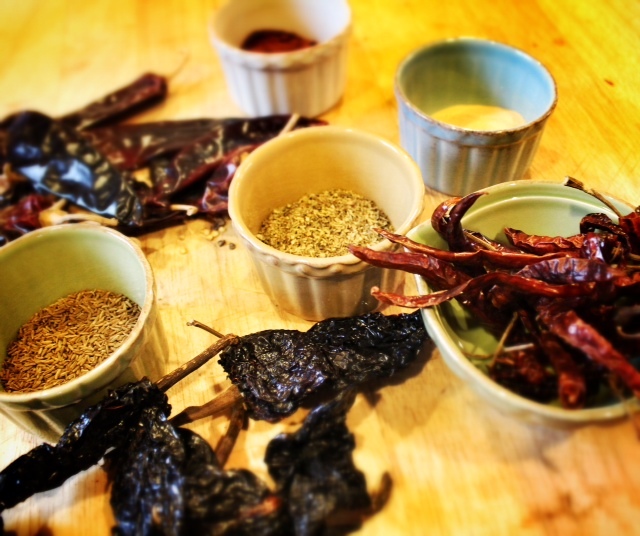 Chile de Arbol – dried and roasted 5 tablespoons Cumin seeds – toasted and ground 2 tablespoons granulated garlic 4 tablespoons oregano 4 tablespoons smoked paprika Toast whole dried peppers and cumin seeds in a skillet until they slightly start to brown. Let cool and grind to a powder. Add other ingredients and mix. Yields about two cups. 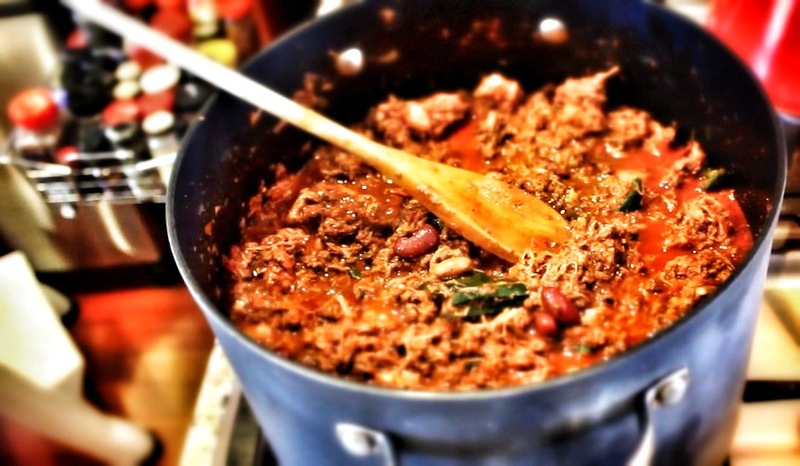 Home made chili powder is the tricks to making this chili a winner. 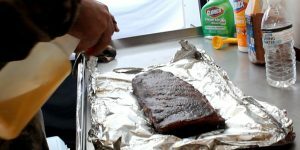 Find the powder recipe at BarbecueTricks.com. Substitute other ingredients as needed. This recipe is a chili cookoff first place winner. Saute garlic and onions until translucent. Add 1/4 of the meat and chili powder and brown. Salt the meat while cooking. Repeat until all meat is added. Add all other ingredients and simmer for one to two hours. Superbowl time means parties and cooking for friends. GrateTV put together this SOUPerbowl Brunswick Stew. 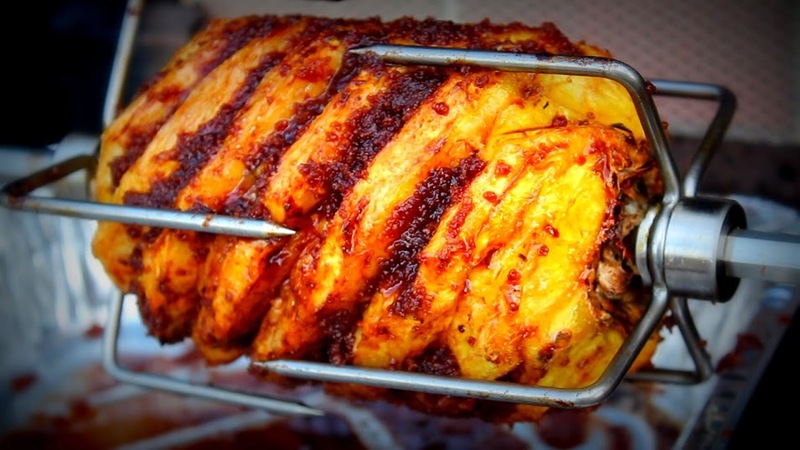 We used leftover BBQ to create a great party dish. 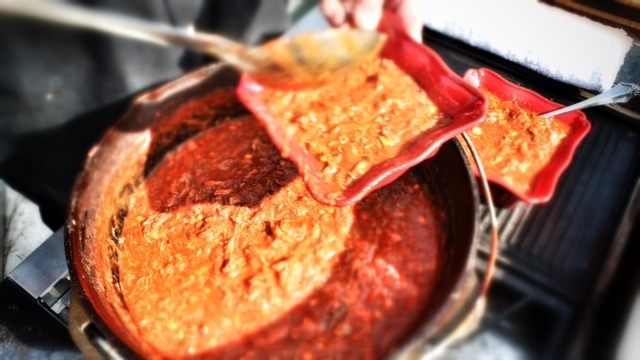 Watch the full episode and see how we made Brunswick Stew step by step HERE. GrateTV took an adventure into creating our own sausage with the Kitchen Aid grinder and sausage stuffing attachment. Watch as we break it down step by step and find out more on the step by step method HERE. The 3-2-1 method for ribs seems to be very popular in competition circles. It’s a barbecue trick that has really caught on. The trick is to follow the 3-2-1 as time frames. That’s it. It’s a simple road map but worth noting that “your mileage may vary” depending on the exact heat of the cooker (base numbers assume holding a stable 225 degrees F) and the size of your ribs. Practice with your key smoker to get it like clockwork. I put the method to music. Give it a look… 2 minutes to brand 3-2-1 into your brain. We go through a bunch of onions at the BBQ Tricks test kitchens and we’re always looking for ways to keep from embarrassing ourselves in front of other good ole boy barbecue cook teams. So we’ve been wondering if there was an easy way to avoid crying every time we cut an onion. Lots of suggestions out there. You can wear swim goggles (and some do) or chop in front of a fan or cut under water… probably works. We’ve even heard that clenching a smoking wooden match stick in your front teeth helps (kinda embarrassing) . but when we saw this old Life Hacker post it got our attention. The idea is suggestion is to avoid the toxic fumes you first just cut out the root end in a cone. That’s where the “gland” for the toxic fumes are. 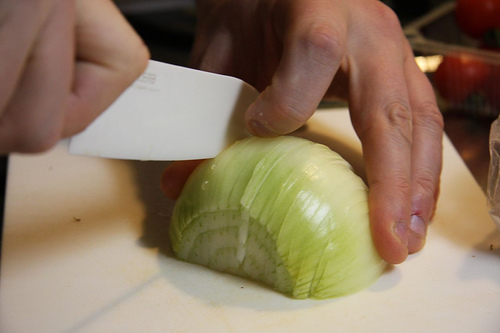 Make the cut about a third of the diameter of the onion and about a third deep. Once it’s out dispose of it immediately and get to choppin’ like “normal. Other suggestions include are using milder onions (like a sweet onion from Vidalia, Georgia) or wiping you knife with lemon juice before cutting. BS? Do you have a way that works for you? Share with us in the comments below. No matter what brand gas grill you have eventually you will have to replace the burner. Fortunately finding burners and other gas grill accessories isn’t difficult. They can usually be found at any store selling grilling accessories. It’s easier and cheaper to buy grill accessories online. Using your computer makes it easy to find high quality gas grill accessories at a good price. Once you have purchased the right BBQ grill accessories you are ready to begin taking out the old burner and installing the new one. The process is relatively simple. It does not require any special training or expensive tools. All you need is a well lit area, an adjustable wrench and the ability to follow simple instructions. It is also important you do not rush. You are working with gas so there is an element of danger. But the average person can safely replace the burner on their gas grill in a few minutes with no trouble at all. The first step is to turn off the gas leading to the grill. This has to be done at the connection between the grill and the main gas line. For the average gas grill all the person installing the replacement burner has to do is locate the LP tank’s nozzle and close it. Normally this can be done by simply pushing a lever. Check your owner’s manual if you are not sure where the nozzle and the lever used to close it is located. If the lever is rusted or otherwise difficult to turn you may have to place it as well. Once you have located the LP’s tank nozzle and turned off the gas, the next step is to make sure there is no gas in the system. Sometimes working to remove the burner may create a spark so making sure there is no gas in the line is very important. To do this vent the any additional gas in the lines by simply turning on one of the other burners on the gas grill for a few minutes and allowing the gas to leak out. While you are waiting for the gas to leak out you can use the time to carefully take of the grill grating. Once the gas has been vented out of the line and the grill grating has been removed you are now ready to locate the nut that holds the burner in place. 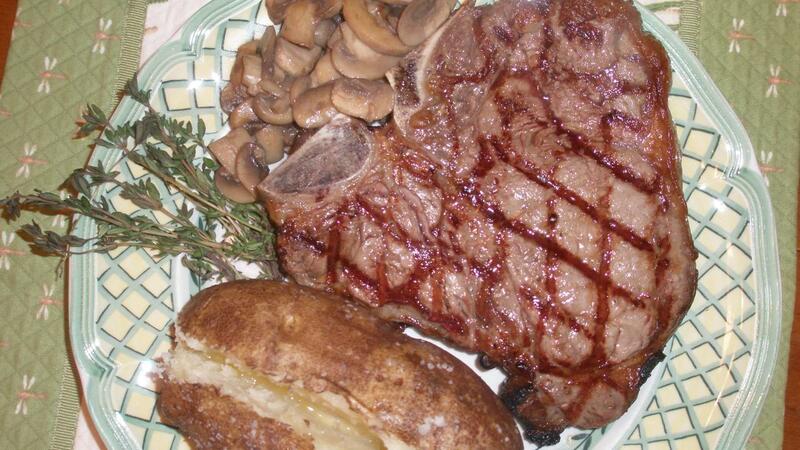 You can do this by tracing the main gas line on the grill. The burner is usually held in place by a brass nut. Depending on the model gas grill you have you may need to lift the grill slightly to find the nut. Lifting the grill will also make it easier for you gain access to the nut. Once you have located the nut you are ready to begin the process of removing it. For the next step you will need to use your adjustable wrench. Generally the brass nut is on fairly tightly. Place the adjustable wrench on the brass nut and turn it to the left or counter clockwise. You may need to apply a fair amount of pressure to get it to begin to loosen. Continue to turn the nut until it comes all the way off. Once you have removed the nut taking off the burner should be easy. Simply pull upward. 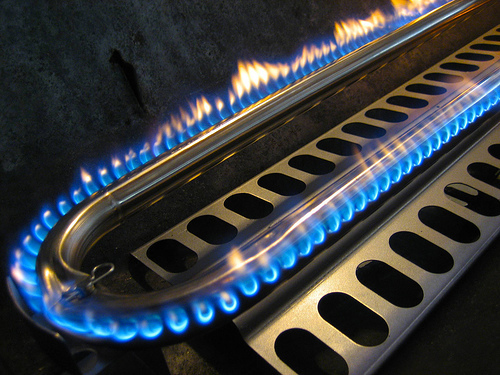 Within seconds the burner should release itself from the gas line. You have now reached the halfway point. You can take a few seconds to see if the burner is indeed clogged or damaged. Next place the new burner on top of the gas line and replace the brass nut. Carefully turn it to the right (clockwise) to make sure the threads on the brass nut are properly aligned with the threads on the gas line. You will know the threads are properly aligned and not cross threaded if the brass nut turns easily. Continue to tighten it with the adjustable wrench until the nuts can no longer move. Next turn the gas on. Listen to see if any gas is leaking out. You should be able to smell any leaking gas. If there is no leak the job is done. 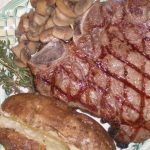 Don’t have a meat thermometer and need a way to know just the right time to pull the steaks off the grill? Use this simple BBQ Trick that we call the OK Handy method for using the ball of your thumb to determine if your BBQ meat is Rare/ Medium / or Well Done. It’s easy… plus how to use a toothpick to test the doneness of ribs. More on the tip HERE or watch the video here.